The British photographer John Stewart is still active at the age of nearly 95. His extraordinary life has seen Japanese PoW camps, encounters with Picasso and Matisse, and a long stint shooting the fashion and business elite of New York. He's also won acclaim as one of the finest practitioners of the still life. Hugh Schofield met John Stewart at his home in southern France. There are not many people who can recall walking along Avenue Foch in 1930s Paris, wearing badge lapels of the right-wing leagues that proliferated in those tense political times. Even more surprising is to hear the reminiscence from the mouth of an Englishman. "Everything was very political back then, and everyone in my very posh lycee belonged to one right-wing club or another. "I was with the Croix-du-Feu, which counted as left-wing compared to the other lot, who were royalists. "But when we went out we would wear both insignia - one of them inverted. Then if we bumped into the royalists, we could change them over and pretend we were with them!" Speaking with John Stewart brings back the past in such vivid detail, you need to collect yourself to remember that these events took place 80 years ago. His English is very lightly accented with French - testament to the mixed influences of his youth and a life now lived mainly in Paris and Provence. It is also peppered with the occasional Wodehouse-ism. He never goes, he tootles. He was born in 1919. His maternal grandfather was founder of the Gestetner copying fortune, and his father was the company's representative in France. It was originally hoped that John too would enter the business - but he had other ideas. The memories flood out over lunch. In 1937 he got his baccalaureate and went to the UK, where he wangled a job as stockbroker at Rothschild's Bank. With other members of the London "jeunesse doree" he joined the 332nd Anti-aircraft Company of the Royal Engineers, which seems to have combined searchlight duties with alcohol-fuelled high jinks around the Home Counties. "Remind me to tell you about John Gielgud's bathtub," gives the flavour. With the outbreak of war, things got more serious. With fluent French, Stewart was trained as an undercover agent and sent to Syria to help in the fight against Vichy. But his ship was diverted to Singapore - at the worst possible time. In February 1942, Singapore fell to the Japanese and Stewart was a prisoner of war. "Early on I had a dream - that I would be in captivity for three-and-a-half years. Afterwards I counted the days, and it was exactly that. "That dream I took as a message of the potential for survival. I asked myself - what is most needed here? And I realised that for 100,000 men there were only seven Japanese speakers. So I decided to learn Japanese and become an interpreter. It saved my life." Stewart believes he is now the last living survivor from one of the worst camps on the notorious Burma railway, Sonkrai. "When the cholera came it was pitiful. When you went to sleep you never knew if the man in the next bed would be alive in the morning. You didn't know if you yourself would be on the funeral pyre by the end of the next day. "No-one knows how anyone will react in such circumstances, but one thing became very clear to me: if you had a good education and a good background, you could detach yourself better - rather than identifying solely with the appalling conditions and the disease." We need to fast-forward now. Dessert is approaching. 1951. Married, living in New York, needing direction. He and his wife decide to spend a few summer weeks in Saint-Paul de Vence, the bohemian colony on the Cote d'Azur. Stewart brought with him a Leica camera - not that he had any intention of taking more than a few holiday pictures. Hanging out at the bar of the Colombe d'Or inn, he made the acquaintance of a Communist poet - who suggested they go and see Pablo Picasso. "So the next day we went to Vallauris. Picasso was normally very gruff with people coming to snoop but he was charming to me, and let me snap away. "At the end of the day I plucked up courage and asked him, would he come to a field of wheat with his painting kit and pretend to paint, so I could photograph him there - and he said. 'Yes!'" That evening, recounting the story in the Colombe d'Or, he got a second invitation - to see Matisse. "He was in bed working on sketches for his chapel at Vence. There was a cat there too which made him wheeze, and my wife was wheezing too. So we didn't stay long." Picasso, Matisse, Georges Braque: these were the start of Stewart's first portfolio. But it was another chance encounter that launched him. "I was outside the Matisse chapel in Vence at its inauguration, and another photographer was there. We started talking and he asked where I got my stuff developed. "'And what is your name?' I asked. "'Henri Cartier-Bresson!' The most famous photographer in France! After that I had no choice. It was photography or nothing!" Stewart returned to New York where he trained under the influential arts director of Harper's Bazaar magazine, the Russian Alexey Brodovitch. He embarked on a highly successful career through the height of Mad Men era Manhattan. In addition to the models and captains of industry he photographed by the hundred, his most famous coup was becoming official portraitist for Muhammad Ali. The sweat-flecked face; the extended arm and fist; Ali holding a butterfly: these world-famous images were the result of a three-day session in 1977. Stewart had been approached by two men who offered him the franchise for a poster and merchandising campaign featuring Ali's image. If he stumped up $50,000, he could take the pictures and have the rights. "So I tootled up to Chicago, and at this vast mansion I was ushered in by a man in a turban. There were about 50 people waiting around for an audience with the great Ali. "Down the end of a long corridor there was a red-and-gold Chinese portico. On one side was a stuffed tiger growling at me, on the other a stuffed lion. In the middle was Ali in sports clothes, slumped over with his head nearly on his knees. "All I heard was a grunt: 'It's Ramadan - I'm hungry!'" Stewart got his pictures, but the franchisers turned out to be incompetent. In the end he sold the rights on to his friend Andy Warhol. The stories keep coming. How Stewart got a job advising David Lean on the making of Bridge on the River Kwai ("My input was zero! He didn't want my advice! "); how Prime Minister Indira Gandhi gave him permission to spend a year in the remote Ladakh region of northern India. His time in a PoW camp left Stewart with an abiding interest in eastern philosophy and culture, and he has travelled frequently to the region. He also set up the IRIS eye charity, which has saved tens of thousands of people from blindness in Nepal, Sri Lanka, Cambodia and Laos. 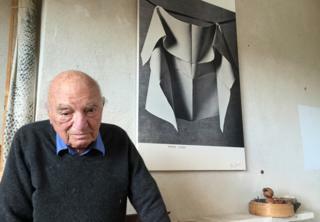 In the last 30 years his work has focused on still lifes - and especially on the folds of cloth. Critics have made comparisons with great artists of the past like Zurbaran and Chardin. He continues to use a rare pigment-based developing technique, which creates, at first sight, an illusion of charcoal drawing. At the end of lunch I have been fed stories about pre-war France, spy schools, Japanese bayonets, butterflies on the corpses of PoWs, the Mediterranean and Manhattan, Rothschilds and Muhammad Ali. The sun is lowering over the Luberon hills. Stewart needs a zizz. I need to tootle.